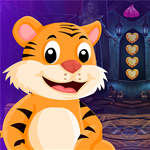 G4K Tiger Rescue is another point and click escape game developed by Games4King. In this game, you came to see the beauty of a forest. But unfortunately, you noticed that someone trapped a tiger in a room of an old forest house. You have to find a way to free the tiger by finding useful objects, hints and solving puzzles. Click on the objects to interact with and solve puzzles. Good luck and have fun! thanks for all your hints and tips in these games alpha! Very cute. Nice game, thanks G4K. Pixel hunting for last diamond. There was a pixel panel in the scene with suit of armor. Knife is weirdly used on crate. Pitcher behind blank panel in scene with roulette wheel. It is already full of water, apparently. Pour in pail (no, not the one you think) next to wood crate.